Your journey into wonder begins in Barcelona with a two night stay. Take a scenic drive to Guadix, home to the Alcazaba de Guadix and the Cave District of Barrio de Santiago. This afternoon you’ll arrive at your captivating hotel in Granada, and this evening you’ll dine within Andalucia’s largest bullring, at Restaurant El Coso, whilst enjoying a traditional La Tuna Folk Band performance. 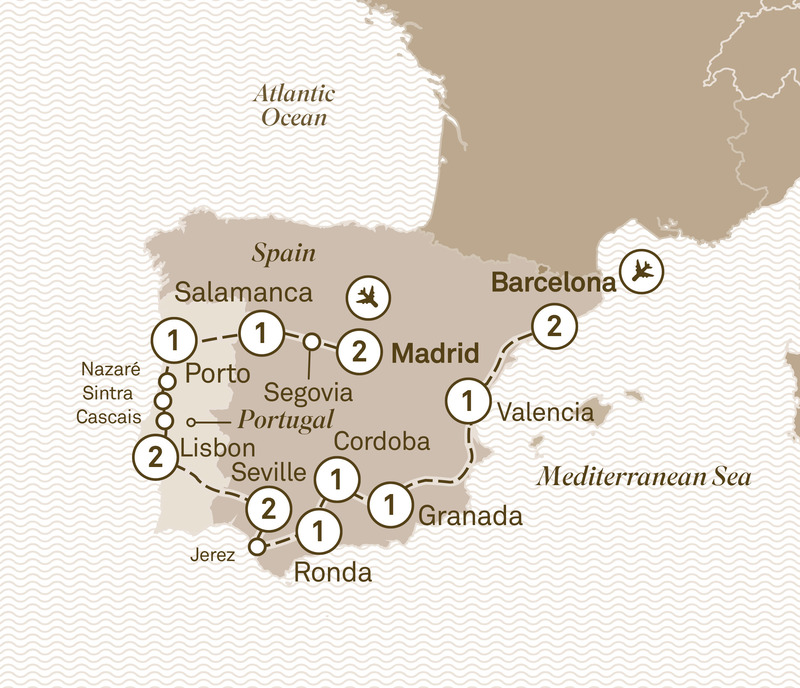 Today you’ll journey to Andalucia’s capital city of Seville. Your guided tour will showcase the city’s beautiful sites such as the Barrio de Santa Cruz, the cathedral that houses Christopher Columbus’ tomb, and the Alcazar of Seville. Relax for two nights. Enjoy a morning tour of Madrid, taking in Plaza Mayor, Puerta del Sol, the “Austrian” Quarter, and the 18th century Royal Palace. Freechoice: Try a fun Flamenco Dance workshop or, if you love the beautiful game, visit the Bernabeu Football Stadium.